Hello, I have a 1998 Corolla that had its front brakes (rotors and pads) replaced with after-market ceramic ones. A week after that, I head grinding noises and took it back to the shop. The left rotor was replaced (just in case it had warped or had a manufacturing defect). But the noise continued. Both calipers were replaced, the rotors ground, the pads ground and there was still no improvement. Both the mechanic and me are at our wits end; this is definately a brake issue and not a bearing issue as the noise reduces when accelerating but comes back when de-accelerating or braking. The brakes seem to be in contact all the time causing the grinding noises and over-heating or the rotors (they are hot to touch after just a couple of miles). Please help. I took your advice to my mechanic and he did bleed the brake lines. I hope this (bleeding) is the same as the 'cracking the line' that you recommened. He also said he tested the pistons in the calipers and that they (pistons) were working fine. I took the car from the shop this evening and the problem still exists :-(. I am trying to get the mechanic to install OEM rotors and pads (from the dealer) instead of the current after-markets ones. Think that will help ? Hi Rags, You have to ask him if, when he tries to turn the wheel, is it tight. If so it has to be determined if fluid pressure is holding it on. or binding due to something wrong with the pads, calipers, or rotors. If the bleeder is opened and the wheel got free it would prove the problem was in the hydraulic system. It then would have to be checked with the tests I sent. If it was still tight after opening the bleeder,the problem is due to the mechanical parts. 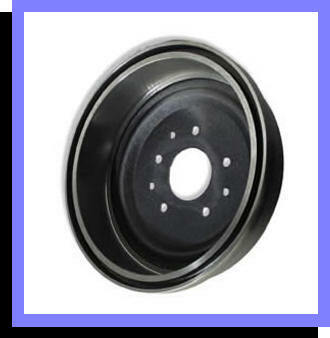 It is possible that rotors or pads are too thick and causing the tightness. The OEM parts finally came in from the dealer. I am going to have the flex hoses (that run to the caliper) replaced -- just in case the inner wall in one of them has collapsed . The driver side is where I think the noise is comming from, so I'll try replacing the hoses on that side first. Thanks for your advice so far. I have no idea what to do if replacing the flex hoses do not help :-(. Does this noise happen CONSTANTLY or only on braking or cornering? Dust shields: Often when techs remove the wheels or rotors the bang the dust shields on they and when its all bolted back together the shiel will touch the rotor... causeing a noise. ALSO: I would like to add that no SHIMS on the pads will cause a squeel noise, which is typical of aftermarket pads..
Good to know that you are a toyota expert. 1) Does this noise happen CONSTANTLY or only on braking or cornering? The grinding noise is low in the morning (when I start for work) but gets louder and stays at the sound-level after a couple of miles of driving. After this, whenever I take my foot off the gas, I can hear the grinding noise easily (even over the radio). Sometimes, when accelerating from 20 MPH to 45 MPH or climbing an incline at about 35 MPH, I hear thumping noises that go away when I take my foot off the gas or accelerate past 45 MPH. Occasionally, while acclerating from 55 MPH to 65 MPH, this thumping noise comes back. At 65 MPH, when I turn the steering wheel to the right, there is squeaking noise (like from a bad water-pump pulley in older cars). As for steering pull, there is a *slight* pull to the left (driver's side) at highway speeds, but no burning smell. As for where for the noise (as well the thumping) is from, I am positive it is from the front, driver-side wheel. As for over-heating (as mentioned in my first post), I had the mechanic replace the after-markets parts (pads, rotors and calipers) with Toyota ones. The over-heating is not that much now ... after 27 miles of mixed highway and local road driving, I can leave my finger on the both rotors for a couple of seconds before my finger gets too hot. My observations lead me to belive (I could be wrong ofcourse) that the pads on the driver's side are making contact with the rotor for whatever reason. I am going to have the flex brake hoses on the driver's side replaced just in case there is an internal-collapse in them. I'll ask the mechanic to check that dust shield is not making conatact with the rotor, thanks. Please be careful touching the rotor... also that is a POOR way to check to see if the brakes are dragging. Its not going to tell you anything the rotors DO get hot and that is normal. As I said above if you smell brakes burning and the wheel (steel or alloy) is VERY HOT to touch then its bad. -The pads are always touching the rotor....that is normal.. the pressure applied is nominal, not enough to slow it down. -You have new pads and rotors, THUMPING can come from the rear drums, you said they were cut... who does that now a days? Alot of shops STOPPED cutting rotors and drums because they were cutting vibrations into the rotor/drum... and the cost per shop hour wasnt cost effective versus replacing with a new one. I doubt you'll find a collapsed brake line... your symptoms sound all wrong to be that. I'm thinking about what that noise in the front wheel well could be... I'm still thinking its the dust shield been pushed in or no shims on the pads making noise. Has you mech. gone out for a ride in this with you? I will go for a ride with someone in the back seat to see if the noise is from the back. The *previous* set of (front) rotors was cut/ground to minimise the noise. I had all those parts replaced with OEM ones (that have not been cut yet). If the symptoms do not add up to a collapsed brake line, I guess that a) it must the rear wheels or b) the dust shield on the front wheel. I will take the car to the shop on Monday and checkout a) and b) as well how freely all four wheels spin when the car is up in the air. I did check this before, but the car had sat for an hour or so. So, I'll do this as soon I get to the shop. As you suggested, I tried the spining the rear wheels with my hand when car was in the air (on the hoist/lift). They seem ok. The mechanic confirmed that he did indeed clean out the rust/dirt on groove of the read wheels when I first took the car back to him. The sounds are definately from the front wheel(s). I had the mechanic replace the flex brake hose on the front driver's side wheel with an OEM hose from Toyota. So, if new, OEM, pads, rotors, calipers and flex hose did not cure the problem, maybe the problem is not in the brakes ?. If not brakes, what else could cause the noises ?. Especially the thumping sound on accelerating upto 45 MPH and then again at 65 MPH. Could it be the bearings ? 2002 Ford F150 4x4 front drivers side has grinding noise. Milan: rear brakes..They evidently ruined his calipers as well.